WA’s most iconic sign, the ‘Dingo Flour Mill’ in North Fremantle has just completed it’s facelift. After almost 80 years of exposure to coastal winds, the sheeting of the ‘Great Southern Roller Mill’ is replaced, and with it a new sign-written dingo to match the original. In the early 1920’s a 15-year old lino-cut designer called Ron Marshall was asked to produce a drawing of a Dingo for a local flour brand. Stamped on all the bags and emblazoned on a water tower above the main factory in North Fremantle, it wasn’t until 1940 that Les Nash was employed to draw the iconic logo that most WA people know as Fremantle’s Dingo Flour Sign. Ex-Compac employee, Leanne, remembers her grandfather, Keith Pittaway, recounting stories of signwriting the flour mill while he was working at Parnell Signs in the 1940’s and 50’s. 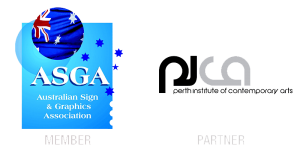 “It is said, Grandpop re-signwrote the dingo logo, (my aunty) guesses it would have been perhaps late 1940’s or early 1950’s … Alan Bond was his apprentice at the time. And on asking Grandpop (who has since passed away, a long time ago), he said yes, “Bondy was my apprentice – he was a useless little b*stard!” (or words to that effect!) Keith worked for Fred Parnell (passed away long ago) at Parnell Signs in Fremantle, the business was taken over by his son, Ross Parnell, but now the shop is closed”. The logo was re-painted several times, and in the late 70’s to early 80’s Compac Marketing Australia signwriter Stuart Duncan, changed the logo from black to red for the first time in its history. He remembers climbing in and out of the small windows to finish off parts of the logo that couldn’t be finished while the scaffolding was lowered up and down – even remembering watching the Queen pass by in a motorcade as he was working on the mill. Stuart was re-acquainted with his project as he worked on Compac’s team that re-painted the Dingo Flour logo in December 2016. For more on the history, read this article from Ansett’s “Sky’s the Limit” article, courtesy State Library WA. The Dingo Flour Mill sign is a cultural icon – many people identify with the landmark. For so many immigrants and travelers as they arrived into Fremantle shipping harbour throughout WA’s history it would have been one of their first visions of Australia. For many others, road trips up and down the coast, or a trip to Leighton Beach would all have been overseen by the legendary dingo. It is because of this that the signage has been heritage listed by the State Government, and the building and signwriting refurbishment partly funded by a State Heritage Grant. This artwork has been approved by both the City of Fremantle and the Stage Heritage Office and was repainted in early December, 2016. Compac has several sign-writers in our team, and specialises in large-format signwriting, (see video here). With a team of graphic designers, signwriters and project managers, Compac has gone to painstaking lengths to make sure that every inch of the Dingo remains the same as the previous version. Measurements of every section have been taken from a cherry picker, including distances apart and shapes of curves. Coupled with long range photographs set up 100’s of metres back with a zoom lens, Compac’s art team have been able to set up a drawing that replicates the exact features of this iconic sign. This reproduction was passed not only to the City of Fremantle, but also the State Heritage Office for a stamp of approval. After printing a scale drawing at 20:1 size, Compac’s sign-writing team (of Jared Walker and Stuart Duncan) applied a grid to this drawing that equates to 1 metre squares on the building, which they used to signwrite section by by section. Graphic designers aside, this traditional technique is similar to the method used by Les Nash to draw the over-sized sign design almost 80 years ago, though with an updated twist that Jared and Stuart have incorporated to provide stronger, sharper graphics that should help it last long into the future. The sign received a unique undercoat and 3 top coats of Colorbond-compliant, weather resistant top-coats of paint to help it stand the tests of time. It’s awesome that this icon will live on for years to come! Never imagined repainting the dingo back in 1977 with city and suburban signs with Stu, Brownie and others would become an icon as it is today.